I've already mentioned my pet peeve about persistent reporting of stock market moves that are insignificant. In Nate Silver's book, The Signal and the Noise, he shows 6 charts that all look similar with varied ups and downs. Two of the charts are based on the stock market data. The rest are based on coin flips. The trends and movements shown on all 6 charts are really hard to discriminate the real from the random. So is the market random? Silver also talks about herd mentality, especially in the form that if certain analytical tools start working then others jump in and the analysis tool no longer has an advantage. So would it be better to just follow the herd? Can you predict what the market is going to do based on how much more or less is being invested in stocks, versus other options or because you need to put your 401(k) money somewhere? 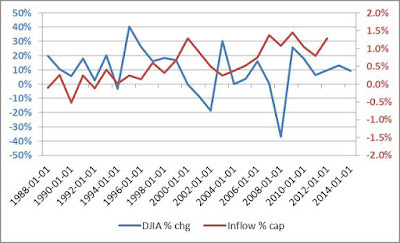 There is no correlation between the percentages of net inflows (that net amount being put into the stock market or taken out compared to the market's total capitalization). But there's interesting parallels in movement. Which moves the other? If the market is going up, do people jump in? If it's going down, do they jump out? Not entirely because even during the last recession and market drop, there was still a positive and healthy flow of money into the equity markets. Not as much as the previous year, nor as much as the following year when the market started to rebound. 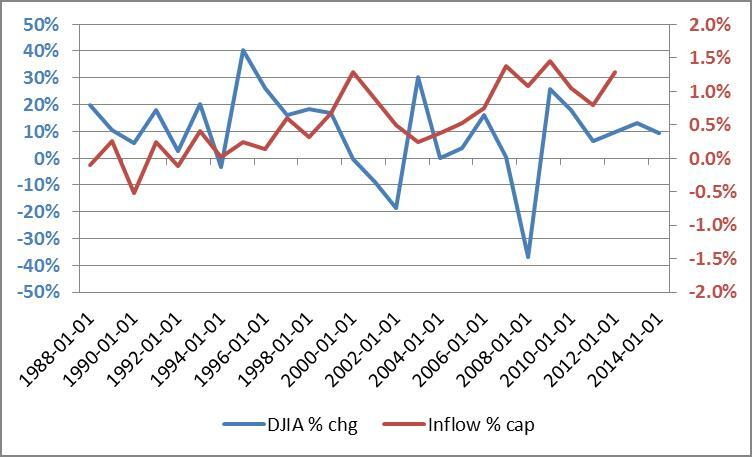 It seems the market is not buoyed by the inflows.